Reviewed by Randy Hertzler, Gelman Library, The George Washington University, hertzler@gwu.edu, reviewed June 10, 2005 and submitted February 15, 2006. Pricing is based on FTE, contact ProQuest. Ethnic NewsWatch (ENW) is a comprehensive, full- text abstracting and indexing database covering the newspapers, magazines, and journals of the American ethnic, minority, and native press. ENW has seen substantial growth since its last ANSS review in 1994, when ENW was delivered as a CD- ROM product. This resource has great relevance for many of the sub-disciplines in both anthropology and sociology, and provides easy access to a broad array of publication types from voices that are often poorly represented in the mainstream press and academic publishing. The broad scope of ENW— covering everything from newsletters and small- distribution newspapers to prestigious scholarly journals—offers something for everyone, from specific ethnic communities to the general public to academic researchers. ProQuest’s clean, clear user interface is highly intuitive and can be navigated by novice users, yet offers a range of advanced features that should satisfy the most seasoned researchers. Backed by ProQuest’s long history of providing top-tier database access to colleges and universities, ENW is likely to have an excellent level of reliability, consistency, and dependability for its users and subscribers; indeed, this reviewer has encountered few problems with stability of access to the database. At the time of the 1994 review, ENW indexed 99 newspapers and journals, and held 99,000 full-text articles on CD-ROM. Today, access is online via the Web and coverage includes more than 270 periodicals, with a database of 996,000 full-text articles as of this review, with more than 218,000 full-text articles in Spanish. Date of coverage spans from 1990 to the present. Ethnic NewsWatch: A History combines with ENW to form Ethnic Newswatch Complete, extending full-test coverage back to 1960. Growth has been cumulative since ENW’s inception in 1991, and the database adds an average of 7,500 new articles per month. Results for the disciplines listed above were obtained using keyword searching. ENW offers a complete list of publications indexed by clicking ProQuest’s “Publications” tab; besides allowing alphabetical browsing of periodical titles, this list is also searchable by keywords in the titles. Dates of coverage are listed for each periodical, and clicking the link for any given publication takes the user to a browsable list of all issues available for that particular title. The Basic Search screen provides a single box for entering keywords, with pull-down menus allowing the selection or addition of other ProQuest databases, selection of general or specific dates, or date ranges. Limits are permitted to any of the specific ethnic groups outlined above, to only scholarly and peer-reviewed journals, and to biographical or personal profile articles. ProQuest defines a scholarly article as one “authored by academics for a target audience that is mainly academic, the printed format isn’t usually a glossy magazine, and it is published by a recognized society with academic goals and missions.” While the usual ProQuest limiter for only full-text documents is also available, this is effectively redundant with ENW, since all articles in the database are available as full text. Users not aware of this feature may attempt—with no result—to increase their search results by un-checking this box. “Citation and abstract” searches the standard fields Author, Personal Name, Abstract, Product Name, Article Title, Subject Terms, Company Name, Source (publication title), and Geographical Name (referring to the location to which the story or article pertains). Boolean operators available offered through drop- down menus are AND, OR, AND NOT, WITHIN 3, and PRE/1. The latter two proximity operators, respectively, force terms to be within three words of each other, or for the first term entered to precede the second by exactly one word. Despite the latter two “pre-set” proximity limiters, WITHIN and PRE can actually be defined by the user with any number desired, so that Boolean expressions using WITHIN 5 or PRE/2, for example, would be possible. Phrase searching is accomplished by the use of quotations, although two-word search expressions are treated as an exact phrase even without quotes. 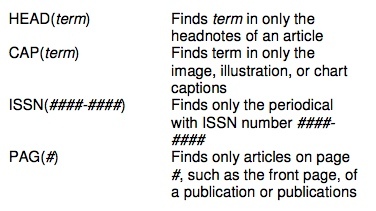 ProQuest ignores any of a list of 76 common stop words, though these can be included in phrase searching by enclosing them in quotations with other terms. The asterisk (*) is used as a right-hand truncation symbol, so that the term “minor*” retrieves the terms “minor,” “minors,” “minority,” and “minorities.” The question mark (?) serves as a wildcard for any single character in a term, so that “wom?n” will find the terms “woman,” “women,” and “womyn.” Neither truncation nor wildcards may be used at the beginning of a term. Nesting of operations is supported in both the Basic Search screen and the Advanced Search screen, and may be applied to specific field searches. Beyond the default search fields and limiters supplied by the Basic and Advanced Search screens, both include a “More Search Options” tab which offers three and seven additional search fields, respectively, plus the ability to sort results by relevance or chronologically. Also, every full-text article is followed by a “More Like This – Find similar documents” box, which allows users to search for more articles with the same subject, location, people, author(s), document type, language, or publication title. Citations examined for this review appeared to be well constructed with no typographical or factual errors. Subject terms seemed appropriately assigned, and abstracts reflected the major points of their complete articles. Author indexing is relatively flexible, allowing either conventional or permuted entry of author names. For example, entering “hooks, bell” retrieves the same articles as “bell hooks” in an author search, despite the fact that this author is listed both ways in the author fields of articles retrieved. Similarly, “Jesse Jackson” retrieves the same articles as “Jackson, Jesse” in an author search. Author names in retrieved articles are hot-linked, so that searchers can find all articles in the database by that author— or any co-authors—simply by clicking on her or his name. Subject indexing adheres to ProQuest’s Controlled Vocabulary of Subject Terms, developed for application to most databases offered by ProQuest and available for searching or download at http://www.proquest.com/proquest/cv-controlled- vocabulary.shtml. This controlled vocabulary is presented in a less intimidating way through the ENW interface by masquerading under the “Topics” tab, where users can choose between “Suggest topics (enter keywords)” and “Look up topics A-Z (enter subject, company/org, location, person).” It is important to note that, while more than 218,000 Spanish-language articles are included, only English subject headings are assigned. This search resulted in exactly one citation, “Texas Recibe Fondos Para Prevenir Ataques Terroristas” (“Texas Receives Funding for the Prevention of Terrorist Attacks”), a Spanish-language article appearing in the publication La Voz de Houston on September 8, 2004. 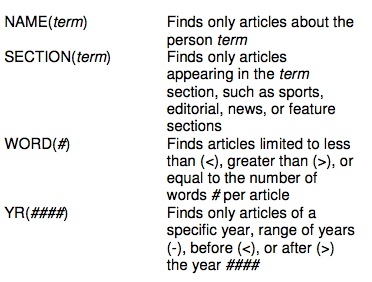 Examination of this record reveals that, while the “Suggest topics” function at first appears to be a hierarchical arrangement of narrowing subject terms, it is simply a mechanism for picking up from one to all of the other subject terms assigned to an article whose subject includes the term entered by the user. Another pitfall involves the “Look up topics A-Z” option in the Topic Guide. Not a true thesaurus, this list is actually an alphabetical list of terms used in ProQuest’s Controlled Vocabulary. No “See” or “Use” references are offered, leaving users to guess the proper terminology for a particular concept. For example, searching the expression “repeat offenders,” which is not in the control language, simply leads the user to the next alphabetical term on the list: “Rees, Mike (person).” The term “recidivism,” on the other hand, is listed in the control language, and as such can be applied to a search or “narrowed” in the same manner as above with “related” terms. Unfortunately, nothing in the “Topics” tab points users to this preferred term. As mentioned earlier, all documents in ENW are available as full text. Citations and articles of interest can be marked using checkboxes, and these items are automatically tracked using the “My Research” navigation tab. Clicking this tab reveals not only all marked documents, but also lists the most recent searches run and their respective results. Any of these searches can be set up to run automatically as SDI alerts, which can be scheduled as daily, weekly, monthly, or quarterly emails for periods of up to one year. Marked documents can be exported as bibliographies using a range of standard citation styles, as full-text documents in whatever format is available, in formats compatible with standard citation management software, or as HTML format that can be uploaded to a server for Web access. All these formats can be saved, emailed, or printed directly from ENW’s ProQuest interface. ENW overlaps with numerous print and electronic bibliographic tools, including Chicano Database, Hispanic American Periodicals Index Online, Anthropological Literature, Sociological Abstracts, America: History & Life, Index to Black Periodicals, Bibliography of Asian Studies, and others. 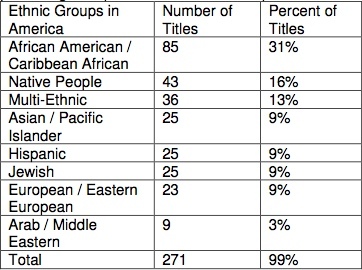 While several of these resources give comprehensive coverage to literature concerning particular ethnic groups, none of these attempts to index publications concerning all the major American ethnic groups. Furthermore, these bibliographic tools offer little full- text access to articles, let alone full-text access to every article indexed as does ENW. This multi- ethnic focus, coupled with advanced export, SDI, and citation management functionality, positions ENW as a unique and vital resource for many types of cross-cultural studies conducted by researchers in anthropology, sociology, and ethnic studies. For researchers searching the literature of one specific ethnic group for whom comprehensive indexing is available elsewhere, ENW can serve as a “starting point” from which more comprehensive searching can proceed. Users researching topics impacting the African American community, for example, will certainly want to consult the Index to Black Periodicals for comprehensive coverage, but ENW can prove useful even to these researchers by providing easy access to full-text resources that may help formulate context and search strategies. Work could be done with the control language and the Topic Guide section of the database. While this functionality certainly serves to “get some stuff” on a given topic—or its approximation—the mechanism behind this is something of a black box, and as such does not inspire confidence that a comprehensive search has been conducted on a given topic. In fact, it is difficult to establish exactly what type of search has been conducted, since a seemingly endless spiral of “narrower” terms can lead the user to the impression that they are searching in circles. Other improvements might involve greater granularity in categories of ethnic groups represented. Broad divisions such as “African American / Caribbean / African,” “Asian / Pacific Islander,” and “European / Eastern European” represent wide cultural divergence and geographic diversity that would benefit from less lumping and more splitting. Finally, while ENW’s large body of Spanish content is a welcome addition to the Spanish-speaking community, the absence of Spanish-language subject headings is something of a shortcoming for these users. Cont. on pg. 8. A range of discipline-specific databases provide more comprehensive coverage of many academic disciplines addressed by Ethnic Newswatch, including anthropology and sociology. However, Ethnic Newswatch offers the unique perspective of these disciplines—as well as general-interest and “issues-related” content—as expressed through the voice of the ethnic press. In addition to Ethnic Newswatch’s unique coverage and full-text access to content, ProQuest’s clean, intuitive interface, flexibility in field searching, and many options for export make this an outstanding resource for all levels of researchers. The interface is simple enough to be navigable by grade-schoolers, yet has plenty to offer even the most seasoned researchers. At a time when most users are pressuring libraries for more remote and full-text access to indexes and periodicals, Ethnic Newswatch is definitely on the right track, and would make an excellent addition to any academic or public library.